Key Specs of Upcoming Smartphone Google Pixel 3 Lite…!!! All top mobile phone companies are working on their devices for their customers. In this regard Google also introducing many new smartphones with amazing features. Now it is working on Google Pixel 3 Lite model and today its features have been leaked in a video. Almost all the key specifications have been leaked in the video. According to the video Google Pixel 3 Lite is coming this year after Google I/O conference. In its features it would come with Snapdragon 670 chipset along with 4GB of RAM and 32GB of internal storage option. 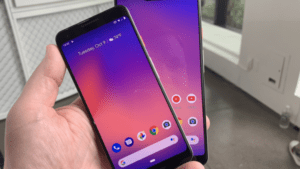 The latest Google Pixel 3 Lite has a large 5.56” display with 1080 x 2160 pixel resolution. The camera details are as it has a 12MP sensor while the front one has 8MP. The battery capacity is 2915 mAh in Google Pixel 3 Lite. The SIM tray has been placed on the right side and having no stereo speakers instead of a single bottom-firing. The Google Pixel 3 Lite has a mint-colored power button and a 3.5mm audio jack at the top. These details are leaked now in a hands on video, the exact release date and price details are not yet announced. Like other smartphone top brands all brands are working to introduce something new and unique for their customers. They are doing this to compete among the market and to increase their selling rates. Google also working hard to introduce the trendy smartphones for its customers. This time a video has been leaked of the upcoming smartphone named Pixel 3 Lite. This smartphone is like the more expensive siblings of the last year’s smartphones. The leaked video shows that the Pixel 3 Lite is coming in this spring after Google I/O conference. In the leaked video it shows that the Google Pixel 3 Lite would come with Snapdragon 670 chipset. There is a 4GB of RAM and 32GB of internal storage option in this mobile phone. It has a big 5.56″ display size with 1080 x 2160 pixel resolution. There is 12MP sensor main camera on the back of the smartphone and 8MP on front. The battery capacity of upcoming Google Pixel 3 Lite is 2915mAh. Huawei also launched its new Huawei Honor 8A smartphone in this month with amny amazing feature. The SIM tray has been placed on the right side and having no stereo speakers instead of a single bottom-firing. The Google Pixel 3 Lite has a mint-colored power button and a 3.5mm audio jack at the top.